At the top of the Castle hill was found a house dating back to Neolithic times. In places Spinera, at the river Oglio, this is the shrine of Minerva of the first century, was burned in the fifth century. 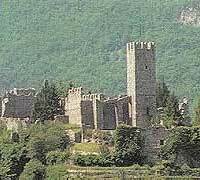 In the Middle Ages are reminded that at the Castle Breno there were two towers, a Guelph, belonging to the family Ronchi, the other Ghibelline, family Alberzoni. Reachable in 15 minutes the lake represents a splendid opportunity to enjoy your sunny day on a boat and maybe dine on the big island of Montisola with its fish specialities from Hotel: Pisogne 25 km . Lovere 28 km. Breno Iseo on the trail of an ancient Roman road. A bicycle and pedestrian path that improves Valcamonica and Lake Iseo.